Hello friends! Today I am going to share with you guys about the android apps that pay you for installing the apps and also that give you credits for just logging in to the app as a daily login credits. Their was a increasing competition from the various apps, so the developers are implementing various business strategies and tricks and targeting to increase their business by adding various features to their app. The daily login credit is also one such business strategy. These apps will let you earn great earnings and hence facilitating for your monthly mobile recharge for free. 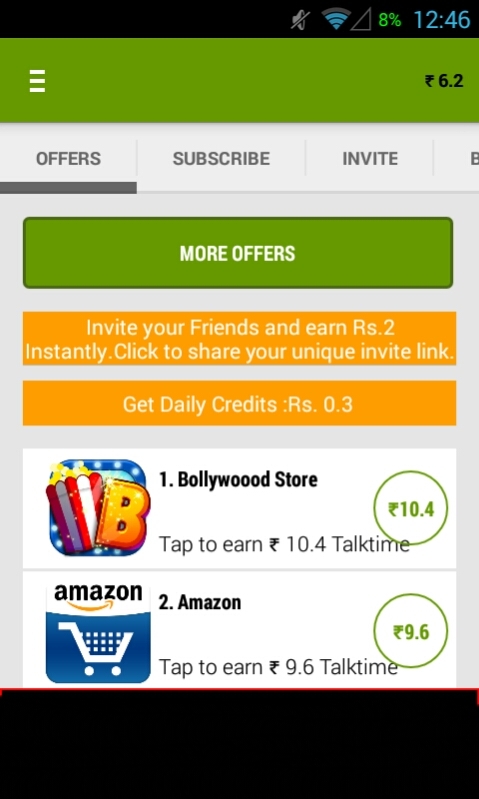 I am using these apps from past many months and hence sharing this post by listing the apps that give you credits from high to low. 1-10 days, you will get 10p per day. 10-20 days, you will get 20p per day. 21-30 days, you will get 30p per day. Like wise you can earn upto Rs.6/- per month if claim daily without missing. Earning Rs.6/- per month as daily login credits is a small thing, But the good one in cash ninja is that you will be getting credits for playing quiz. In this you will be asking 4 questions for which you have to answer, oops :) don't worry! No minus credits for the wrong answer's, this feature is only to improve your general knowledge and will earn you Rs.1/- daily for completing any 2 offers from cash ninja, and you can complete the target easily by completing click to earn offers in which you no need to install any apps and these click to earn offers will be available to you almost everyday. This means that you can earn almost Rs.36/- with in seconds by simple steps without installing any apps daily. Trust me cash ninja is a good free recharge app that pays you higher than any other apps and that's the reasons I've listed this in the 1st. It gives you a good daily credits. UReward gives you 5 points as the daily login credits which is equal to Rs.0.50p/- per day. Likewise UReward gives you Rs.15/- per month as login credits. ZipTT is the another good app to get free recharge on your mobile. >1-20 days - 20p per day. >21-30 days - 30p per day + Rs.2/- as bonus. >From 31st day onwards 40p per day + Rs.3/- as bonus. >Likewise you can earn Rs.12/- as daily credits per month. Dosera is the free recharge app that will pay you for daily login. It will gives you Rs.0.30p/- as the daily login credit. Likewise it will pay you Rs.9/- as the daily login credit. Amulyam is the free recharge app that pays you for daily login to the app. Of course amulyam pays you comparatively less when compared to the other services in terms of daily login credits. Online Mobile Recharge websites and free recharge app are very popular in young generations because of awareness and offers by the companies.